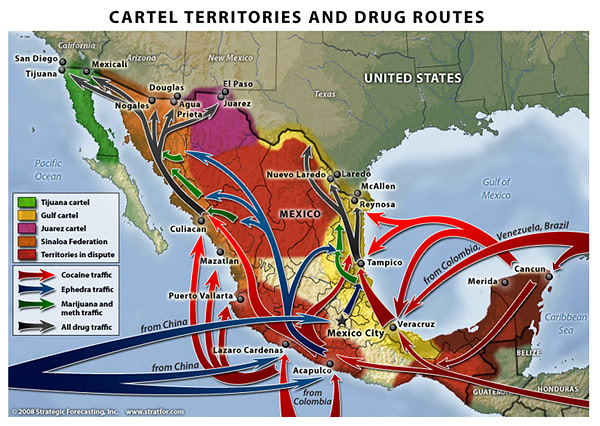 MEXICAN DRUG TERROR. While Spring Breakers from the U.S. show no sign of staying away from booze and fun in Mexico despite the ongoing slaughter in the country’s war on drugs, the latest developments close to the Unites States’ border might make one or two regular tourists think twice about their holiday plans. During the last weekend, police found 49 mutilated bodies scattered in a pool of blood near the border with the U.S., a region where Mexico’s two dominant drug cartels are trying to outdo each other in bloodshed while warring over smuggling routes, the NPR reported on Monday. The bodies, some of them in plastic garbage bags, were most likely brought to the spot and dropped from the back of a dump truck, Nuevo Leon state security spokesman Jorge Domene told the news broadcaster. Deeds like that have become almost normal in Mexico’s war on the drug cartels, which don’t seem to stop short of anything in keeping police and military away from its operations. A year ago, beheaded bodies were found in former tourism hotspot Acapulco on Mexico’s western shoreline, one of many similar attempts to scare citizens and law enforcement. The bloody war does not seem to scare U.S. Spring Break youngsters away, though. Not least from bordering Texas, young visitors cross the border for drinking and partying in a supposedly more relaxed Mexican environment. According to an announcement in May from the Mexican Tourism Department, 77,000 young tourists from Texas visited Mexico on spring break trips between March 5 and 30, up 7.2 percent from one year before, the Associated Press reported. In early March, the Texas Department of Public Safety advised students on spring break to avoid Mexico, citing violence. Overall, the number of U.S. tourists visiting Mexico in March totaled 382,376, young and old. That is a 7.3 percent increase from 2011, according to the news agency. Estimates suggest that the war on drugs has cost about 50,000 lives since 2006, MSNBC reports.